To take my makeup off I use the GarnierMicellar Water. This year I got off the face wipes and into this and I haven’t looked back since. It requires a lot less scrubbing and a lot less irritating on my super sensitive eyes. For cleanser, I’ve forever been obsessed with the Liz Earle Cleanse and Polish since the day I tried it. It’s that good, it really is. My go-to cleanser, the one I recommend to everyone and any one. It works for all skin types and as I have mentioned many time – everyone knows I love it too. Pictured though, is a Limited Edition Liz Earle C&P OrangeFlower and Chamomile* version that I’ve been using since the summer as I don’t have any of the original one left and although I have grown to really like it, I do prefer the original. For a scrub, I love The Body Shop Vitamin C Microdermabrasion, this stuff is unbelievable. I honestly still can’t get over the results. My skin is the softest I’ve ever felt after I use this. If you’re looking for a new scrub to give a go, try this one. Or even just pop into store and try a little out on the back of your hand, you’ll see what I mean! Facemasks is something I just love treating myself to. The Aesop Parsley Seed Cleansing mask is a definite favourite but unfortunately I didn’t have one here to show you. The best mask I’ve tried but a little bit on the pricey side so that’s why I often use the Superfacialist byUna Brennan Tea Flower Deep Clean Purifying Clay Mask as it does the job and is so much cheaper. Really recommend this if you’re looking for a budget facemask! For moisture, as usual, I love the Origins Drink Up Intensive Overnight Moisture Mask. Pop this on at night and you go to sleep and wake up with your skin feeling like a total dream! The toner ALWAYS on my list is the Liz Earle Instant Boost Skin Tonic, this is so soothing and makes my skin feel, well, soothed. Great if your skin is feeling a little bit irritated and a lovely step in my skincare routine. Another favourite is of course the Liz Earle Eye Bright Soothing Eye Lotion and this product is a total godsend. I get really irritated eyes sometimes, sometimes it’s affected by my allergies but this product just sorts it right out. It feels amazing and even more cooling if you pop it in the fridge! Finally, us gals with dry skin need a good moisturizer in their routine and there’s been two stand out favourites this year and I’m talking the A-Derma Nutrialba Rich Nourishing Cream* and the Liz Earle Moisturiser for Dry/Sensitive Skin* and both amazing moisturisers that are so hydrating and I alternate between the two. What skincare products have you been loving throughout 2014? 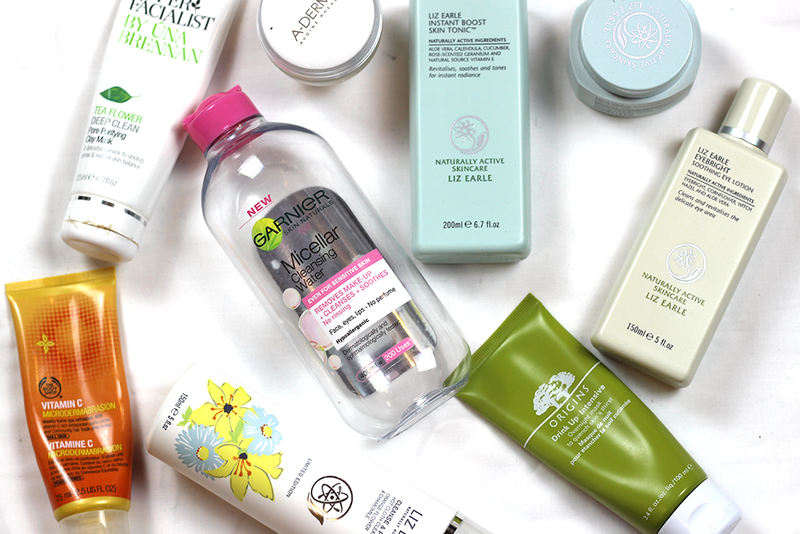 Enter my giveaway to win some of my winter beauty favourites! Thanks Alice :) Ooh, really like GinZing eye cream too! Garnier Micellar Water is amazing I'm so glad I discovered it this year. I actually like it better than Bioderma! I use mostly Simple for skincare. I used to have terrible skin but its cleared up now thank goodness.